In 2012, Ryan signed with Team Penske and recorded five top-10 finishes during his first year in the XFINITY Series. That same year, he became the youngest winner in Truck Series history at just 18. Since then, he’s proven himself a versatile driver with stints in the Cup Series and XFINITY Series. 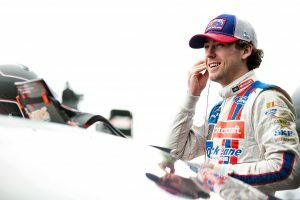 In June 2017, he captured his first Cup Series victory at Axalta presents the Pocono 400 at Pocono Raceway. Ford Fusion as their third full-time car for the Monster Energy Cup Series. We caught up with Ryan to talk about his accomplishments (so far) and expectations for 2018. You’re a third generation racecar driver – did your dad and grandfather influence you to get started in the sport, or did you naturally follow suit? My dad was a big influence on getting me started. He got his start because my grandfather influenced him. It’s nice to be a part of the family tradition by keeping the Blaney name in racing. You’ve raced and won in all three NASCAR Series (Monster Energy Cup Series, XFINITY Series and Camping World Truck Series). What’s it like racing in these different leagues? Each series differs a lot – from the cars to the people and experience levels you are racing with. I’ve enjoyed being able to race in all three divisions, and find success in each of them. How did it feel to win your first NASCAR Monster Energy Cup race? The first win was great. To achieve that for the Wood Brothers organization, especially the founding brother Glen and Leonard Wood, was very special. I’ve looked up to the team for as long as I can remember and it is an honor to be on the list of winners for them. We are working hard to get win number 100 for them. What goals do you have for the remainder of the season and into next? We want to win number 100 for the Wood Brothers. It would be a great accomplishment for everyone involved. I feel like we can get it done and, in the process, try to win a championship. What’s it like racing for one of NASCAR’s longest tenured teams, and one of the most successful? Being with a team that’s been part of the sport for 67 years is pretty incredible. Hearing the stories of the greats who have driven for them is a humbling experience. I am so grateful for the opportunity to drive the No. 21 for the Wood Brothers. You will be joining Team Penske full-time in the Monster Energy Sprint Cup Series next year. What are you looking forward to in 2018? It’s been nice to be part of the Penske group since 2012 when I got my start in the NASCAR scene. Building my relationship with them has been one of my main goals. It’s what we – the organization and myself –aspired to do since joining forces. It’s pretty neat to accomplish that goal. I’m excited to drive the No. 12 car, and bring Team Penske a third in-house car – that’s really special. To drive for Roger Penske and capture a Cup win is something I’m looking forward to. If you could race anyone who would it be and why? I would like to race against my father. Most people might know we had a chance to race against each other in my first Sprint Cup Series start in 2014. He unfortunately didn’t qualify for the race, but it would have been neat to race against him. If you weren’t racing you would be? Honestly, I have no clue! That’s why I race! Any interest in racing other series outside of NASCAR? I do, I love all types of racing!